It is hard to believe that Pam and I started full time RV living eleven years ago! Before that time we knew we loved RV travel and all the benefits there were for us, but we were not sure how long we would try it for. We did not plan an exit strategy, we just figured we’ll “grip it and rip it” and see where it leads. There is so much of our story on our website about full time RV living, and our business endeavors, so I am not going to rehash that here. What we did want to share is some of our latest revelations of things we experienced in our recent travels. We spend a fair bit of time in Texas at the National RV Training Academy. When we are not teaching we hit the road and travel to locations where we can help others with our business services while we enjoy RV travel and the tax advantages of operating our business on the road. We left Texas and headed to Alabama in late January. 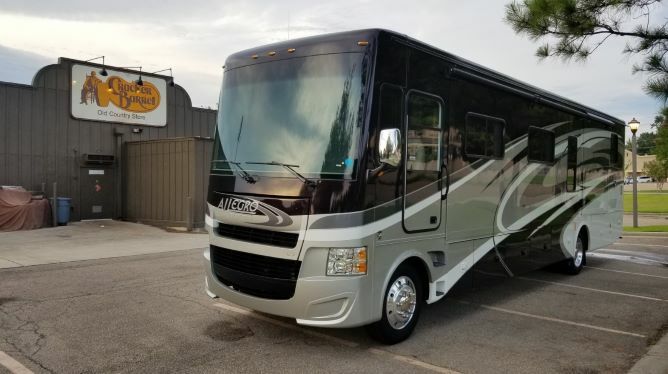 We had two purposes for going: one was to visit Red Bay, AL where Tiffin Motorhomes is located, and the second was to work with some RV inspection clients while we were on the road. We needed some minor repair work on Miss Tiffy and the factory service department at Tiffin is really the best place to go. The dealerships take too long and you don’t get to stay on board and interact with the technicians as you do at the Red Bay location. The only problem for some could be that when you go you don’t get to schedule an appointment. 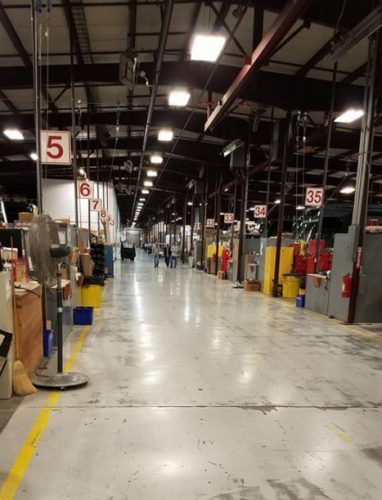 You check in and wait for them to call you to a service bay. It could be a day or two, or it could be a week or longer. But, you get to have your issues addressed directly with the technicians and you are there to see what is done. For Tiffin owners, this is a really nice service. So, we learned if you want your service issues addressed, go to the manufacturer’s service facility for peace of mind. Since we have had Miss Tiffy, purchased last year in July, we have had it weighed twice. The first time we were grossly overweight (get it, GVWR, Gross Vehicle Weight Rating). 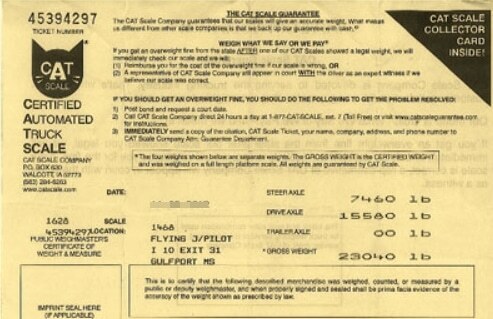 We just drove over the CAT scales at a Pilot/Flying J location after we had removed approximately 1,000 pounds since the last weighing, but we are still over the GVWR rating with full water and full fuel. So far in our full time RV living journey, we have never had a storage unit. The best scenario has been a motorized unit pulling a trailer, but we wanted to get away from that. We just want the RV and our truck. That being the case everything has to fit in both and not exceed the RV’s cargo carrying capacity. For the first time, we have had to get a storage unit so we could take out all the extra stuff and weigh Miss Tiffy. Now that all that “stuff” is out we just need to get rid of a little more and we’ll be okay. But, that means if all the stuff that is in the storage unit does not fit in the truck, some of it has to go. What we continue to learn is that you really have to be diligent in watching how much of your possessions are loaded into the RV and do not exceed the recommended cargo carry capacity. If you do, then you are risking damage to the running gear and are also risking safety. 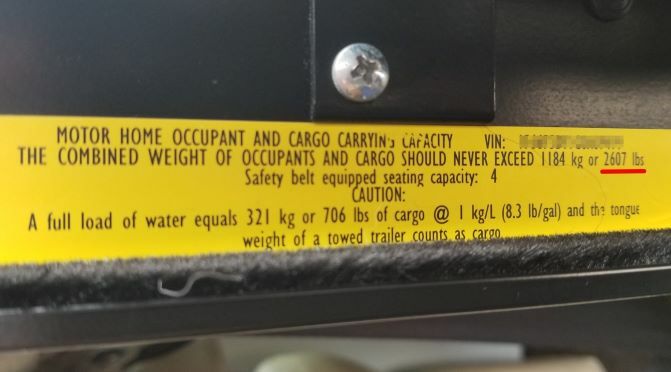 Weighing the RV on a regular basis is the only way to know that you are traveling safely! Reducing Bodily Injury to My Head! When we purchased Miss Tiffy we chose a particular floorplan so I would not have to bend underneath curbside slideouts to get into our storage bays. RVers are delusional if they think everything they need will fit inside the RV and the storage bays are for occasional use. We are in and out of them constantly. So, that plan has worked well. Everything we think we need on a regular basis stays on the curbside of the RV and the rest is on the streetside where our two slides reside. However, the streetside contains the plumbing bay which houses the water, sewer, and electric service. This area is also accessed very regularly. It is located beneath our main larger slideout which extends out almost three feet. That requires a lot of bending underneath the slideout to access this area. Setting up and breaking down with the slideouts out has lead to encounters of my head with the slideout t-molding, which can be sharp! Even wearing a hat has not saved me from a bleeding incident. I have talked with other RVers. I am not alone in this activity. While getting ready to leave in January I was wearing a heavy coat due to temperatures in the thirties. I had my hood on as well. While working to get the RV services unhooked I hit the front portion of my head on the lower Schwintek rail of our rear slideout and about knocked myself out. With my hood over my head, I just misjudged things. Advil was the solution for that stupidity! So what have I learned? When dealing with a Class A motorhome, regardless of what I am doing I have to take the time to pay attention to where I am when under and around the slideouts to be sure to avoid another bloody incident. I have had to change our order of events a little when coming and going from RV sites. When hooking up and removing services from Miss Tiffy I now make sure the slideouts are in. This situation is a problem mostly because compared to the other RV’s we have owned, the storage bays sit lower than our other full time RV living RV’s. We also discovered on recent travels that not all Cracker Barrel locations allow RVers to stay overnight in their RV/Bus lanes. We have never had an issue up until recently. I am sure that is due to either a city ordinance or because disrespectful RVers have taken advantage and ruined it for others by taking up residence instead of showing up for the night, having a meal, and then leaving the next morning. We have seen people at Walmart locations with their slides out, jacks down, chairs, grill, and patio mat lout like they are at a campground. That is not the intent of boondocking at Walmarts and Cracker Barrel locations. The best rule of thumb for places that do allow overnight blacktop RV parking is to not look like you are staying overnight: slides in, jacks up, if a towable RV have the tow vehicle attached, and don’t stay too long unless clearing it with the management of the location. We have known for years that truckers really don’t like RV’s in their fueling area. They seem to get frustrated with us being on the highways as well. They like to cruise along at the maximum speed, and then some. I, on the other hand, have discovered that reduced speeds are safer and less stressful. These big RV’s don’t stop easily and it is easier to do that by reducing the speed a little. We like to travel at 55-60mph regardless of the maximum speed. We were boondocking in a Flying J truck stop recently while heading west to Texas. We decided to take an out-of-the-way end spot to not get sandwiched in between two trucks. I also shifted the RV towards the outside of the lane. A truck pulled in, got very close to us, ran his generator so as to blow the diesel fumes at our entry door, and then later threw a bag of chicken bones and a half drunk soda out of his passenger side door at our RV. Nice! We only stayed there because we were out visiting friends and we parked at the truck stop because we thought it was safer than leaving the unoccupied RV at Walmart. There were no RV parks in the area and we thought this would be a good option. We don’t typically stay at truck stops, and this further confirms the reason why. Not to mention the whole place smelled like urine. The lesson learned? Only stay at these locations in extreme emergencies! We have known about this for years and have visited several locations. 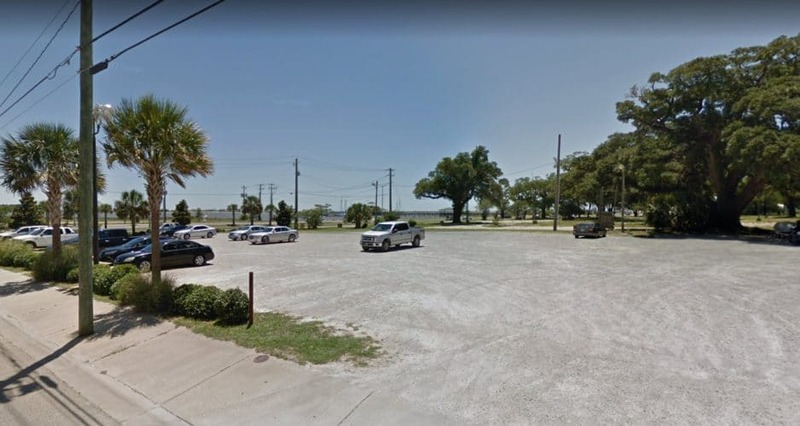 What we learned recently is that there are several along the Gulf Coast of Mississippi that are right across from the beach, allow multiple nights of boondocking, and they have security on the premises. These boondocking spots are usually parking lots that are on the outskirts of their facility where there is space for larger vehicles. While staying at Harrah’s in Biloxi, MS we had the chance to visit the beach, take long walks along the peninsula and stay for three nights for free while getting to enjoy the water. Winter time at beach locations is difficult because the snowbirds take up spaces, raise the nightly fees, and leave no availability for the transient crowd. So, we learned to never give up on finding something! Pam found this location and it was a nice surprise. 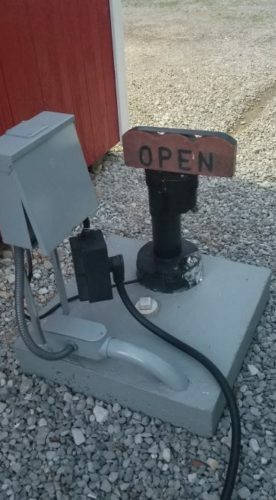 Having worked in the maintenance department of several RV parks I can say with assurance that the RV park electrical pedestal may not always be adequate to supply the needed power to my RV. After blowing up my EMS unit three times in the early years, I learned that testing with a voltmeter first is a good thing to do! While in Alabama, along the Gulf Coast, we visited an RV park that we have visited on and off for the past four years. It was newer back in the earlier years but now it has been a bit neglected. I can always tell by the condition of the electrical service. When I flip the breaker prior to plugging in and the spring action is loose, to me this may indicate a problem. I had just parked the RV, it was raining, and I decided to just plug in the EMS unit and omit the voltmeter check. It indicated low voltage on one leg of the 50 amp service. I got out my voltmeter and double checked before having Pam run to the office to seek a solution. The voltmeter confirmed my EMS results. We had 12 volts on one leg and 126 volts on the other leg. The EMS unit will not allow power through to the RV with this condition. That is why these devices are so important! We contacted the RV park office. Their solution was, “just don’t use the EMS unit!” That is not what I wanted to hear! You don’t run things in the RV with low voltage. You can do serious damage to electronics and appliances! I told the RV park maintenance person that if he would get me a new breaker I would replace it. I know liability wise that should not be allowed, but he went to go find one. They had no one on property to perform this fix and the person who could was not going to be back till that evening. The other option was to move to a less desirable site. A new breaker was delivered and I replaced it with the member of the RV park staff watching me. Once replaced all was good. The whole repair only took a few minutes. The nice thing was he offered to go to the office to see if he could get us a free night for helping out. He did and we were happy! Once again, I confirmed the reason why I never trust that the electrical service is adequate and why I always check first before plugging in my shore power cord to an unknown source. Being lazy and ignorant of this issue could be costly! Okay, so those are a few things I wanted to pass along. Maybe they will be helpful to you. Please feel free to leave a comment before you go. I am very new to this and I do not care how old this post is, it was/is very helpful information to me. I am really looking forward to hearing more of the things you have learned over the past 11 years on the road. Thanks for stopping by our website Jon!